History Pub: Dr. Dennis Jenkins "Old Poop and the Peopling of the Americas"
The Lane County History Museum and the UO Department of History sponsor ‘History Pub Talks’. These are casual events to grab a bite to eat, a pint to drink, and a seat to learn about our history. 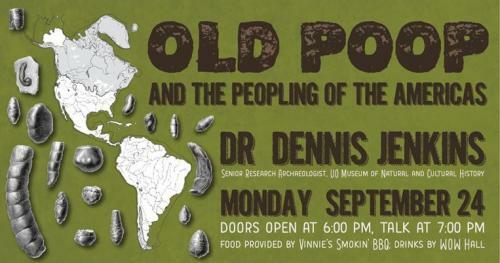 The First History Pub of the Season: "Old Poop and the Peopling of the Americas" will be at the W.O.W. Hall on Monday evening, September 24. Doors open at 6:00; program at 7:00. Food provided by Vinnie's Smokin' BBQ; drinks by the W.O.W. Hall. Dr. Dennis Jenkins is a senior research archaeologist for the UO's Museum of Natural and Cultural History. His research has focused on the first colonization of the Americas and it is his Paisley Caves Archaeological Research Project in Central Oregon -- which recovered the oldest indicator of human occupation in North America, 14,000-year-old poop (coprolites)! He will speak on this discovery and its implications for the current theories about the peopling of the Americas. On October 22 from 6:00 pm - 8:00 pm, History Pub will host author R. Gregory Nokes at the WOW Hall speaking about, “The Troubling Life of Peter Burnett”.